Chris Coleman says he is unaware of any agreement between players and clubs which would allow some of his Wales squad to play in the Olympics. British Olympic Association chief executive Andy Hunt claims at least two have agreed to play for Team GB. Hunt says Craig Bellamy and Gareth Bale have agreed to take part with the blessing of their clubs but Coleman says he is unaware of any such deal. "Ideally I wouldn't want any of our players involved," said the Wales boss. Coleman added: "Most of the clubs I talk to, or managers that I talk to, are not that happy about it. "Obviously the clubs they've talked to have agreed to it otherwise they wouldn't come out with that statement." Bale and Bellamy, as well as David Beckham, are on a list of 80 players told by the Football Association they are in contention for a place in the 18-man squad. The Football Association of Wales (FAW), along with the Scottish and Northern Irish associations, fear Team GB could threaten their independence. Although the FAW opposes Welsh internationals featuring at the Olympics they have said they will not stop their players from taking part. Bale and Wales captain Aaron Ramsey have previously stated their desire to play in the Games and have been photographed wearing Team GB shirts. 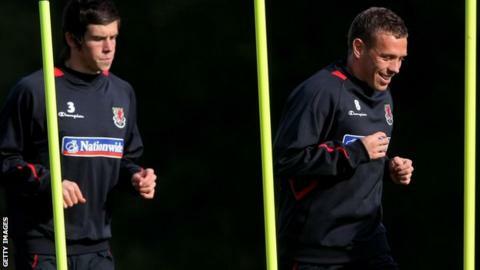 But Coleman is concerned that the Olympics will affect his plans for the start of the World Cup qualifying campaign in September. As part of their preparations for the opening game against Belgium, Wales face Bosnia-Hercegovina in a friendly on 15 August - just four days after the Olympic football final at Wembley. "I understand the players that want to play in the Olympics. Of course it's an experience you maybe will get only once in a lifetime. "We've always known that some of our players could be involved in it. It's no big surprise. "I can't say I'm delighted about the fact that if they get to the final, four days later we've got a game. "But there's nothing we can do about it. We've just got to get on with it."